Sometimes I have to remind myself that God is always on my side and He loved me so much to die for me. Today's card reminds me of this truth. The base of the card is made from Lemon Grass Cardstock. I then cut a piece of Sweet Berry Cardstock and Spring Parade Pattern paper. On a piece of Whip Cream Cardstock I stamped the wreath using the Lead Me stamp set. I started by drawing a circle on the Cardstock. I then took the 3 branch/leaf stamps in Kiwi Slice, Limeade Splash and Lemon Grass Ink. On a separate piece of Whip Cream Cardstock, I stamped the 3 flowers with Sweet Berry Ink and fussy cut them out. I added the Whip Cream thread to the card by punching a small hole on the fold of the card. I knotted the thread and added a piece of Bubble Gum Satin Ribbon, then tied a bow. 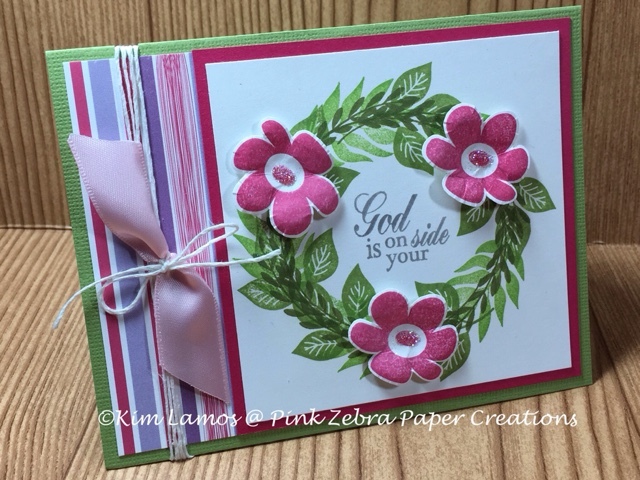 To finish the card, I added dimension to the flowers by doing a swirl motion on the back of the petals with my Bloom Tool. I then added them to the card with foam squares and added Journey Glaze and Journey Sparkle Dust to the centers. Enjoy! Hello Kim,you are awinner on my blog: http://craftchaos.blogspot.nl/2016/03/great-day-for-winners.html,please contact me.